Galaxy backgrounds are both super fun to make and incredibly nerve-wracking. They look a hot mess until suddenly, they don’t. But then you add black, and a smattering of stars (in this case, white paint) and suddenly, you have a cool galaxy background. Who knew! This is the Space Western set. I used the new Tim Holtz for Sizzix star dies with glitter cardstock underneath for a bit of sparkle & movement! For the sentiment I used a Lawn Fawn stamp plus “Shiny” from the Space Western set. I absolutely love how this turned out. So much fun! The blog has been abandoned for a very long time! Craft-wise, I’ve shifted focus over the years. I still knit. These days, however, more often than not I am papercrafting. I have fallen in love with coloring stamped images, and what better way to share those images than sending cards to people I love? Cards are fun to make and fun to send! So it’s a win-win! I still knit. I still sew. I see more than I knit actually! But papercrafting is really where my heart lies these days! Back in the fall I realized that Littlest’s pumpkin hat (from when he was a baby!) was getting a might small. Time for a new hat! I did think about just making another pumpkin but decided since I had this lovely extra-chunky yellow yarn, that a candy corn hat would be MUCH more fun to make. Course I was all proud of myself for using stash yarn til I realized I had to BUY orange and white to make it work. Oops. But that’s ok.. a) I’ll totally use the white and b) the orange was majorly on sale. The white and yellow are both Cascade Yarns Magnum and the orange is Debbie Bliss Como. I looooove the Magnum in a major way. It was on sale a while back at my LYS and my boy begged for some red. So we all picked out a color.. yellow for littlest, aqua for me, and red for eldest. I still don’t know what to do with the red though. Contemplating a colorwork hat for eldest as he can still wear his other red hat. Maybe with white snowflakes? I dunno. He doesn’t wear hats a lot. Youngest, on the other hand, LOVES hats. I winged the pattern after perusing online a little bit. I thought, how hard could it be? And indeed it was not hard once I established what gauge I had. I think the yellow is straight up, the orange starts decreasing every other row, and the white is every row. Or something like that. Funny thing about candy corn accessories: People seem unable to decide what order the colors are in. I had to go look at some real candy corn! Anyway, I love how it looks, and youngest appears to love his hat too. He requests it! How cute is that? And we get lots of comments. I assume this is a good thing 🙂 He’s very cute in it. I have a few other hats on the go… a snail hat (Zimmermann pattern) for eldest, a thinner silk slouchy hat (again) for me, and a few baby hats 😉 Perhaps this will be the year of the hat! Or not. Perhaps it’s just the phase of the hat. At least they get used and appreciated! My boys have two anatomically correct dolls. At a certain age they loooooove them. There’s just something about toddlers wanting to take care of babies that is universally adorable. Unfortunately since the dolls don’t get played with a lot and it’s for a relatively short period of time, it sort of drives me crazy how much doll clothes are. There aren’t that many options for “boy” clothes, either. I’ve tried to make doll clothes before by winging it and, to be frank, they sucked. Sewing clothes is not my forte. The boys *like* changing the doll clothes but I can’t make myself spend as much as would be required. Therefore they just don’t have much. 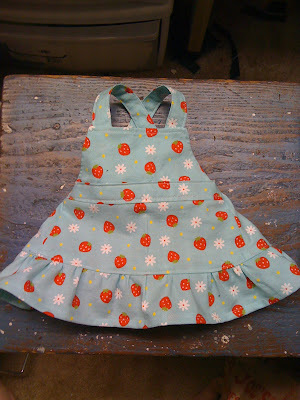 The thing is, I really *want* to make doll clothes. Not only for their pretend play, but something about it seems so satisfying. And tiny! And tiny == cute, therefore I must figure it out. Eventually I stumbled on a Simplicity pattern with sizes from 12″ to 22″ dolls, and thought, you know, I should buy it and go from there. I am pretty good at altering patterns.. just not making them up from scratch, apparently. My first opportunity (well, besides ignoring the needs of my own children of course) came this weekend when I decided to make some doll clothes for a little friend’s 6th birthday. This little girl loooooves her American Girl doll, and since this pattern has some 18″ doll clothes, I thought, why not? And staying true to my new years resolution, I even used stashed fabric! That I normally would have saved but since it had no intended purpose I decided not to be afraid to use it. 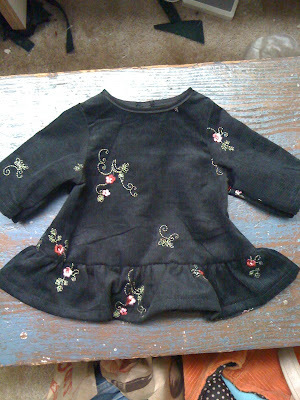 Plus the black corduroy was someone else’s stash that they gave to me! Gave! For nothing in return! I should make them some doll clothes too. I chose two dresses to make and voila, I love them! They took SO MUCH MORE TIME than I expected, but I do like them. I hope they fit the doll! As I don’t have one of my own it was a little hard to test the sizing! I always forget how long it takes to cut out patterns. Oh. My. God. No wonder I prefer knitting. Sewing is far too exact for me. On the bright side, a friend shared the tip of using freezer paper for patterns and that works so much better than what I used to use! So that’s good. And this pattern is also nifty in that you can re-use a lot of the same pattern pieces for different garments, so a lot of the cutting out work is now done. I actually did enjoy making them, although parts were tedious, as sewing always is. If I hadn’t tried to do two in one night I’d probably be a bit happier. But that’s what I get for not planning ahead I suppose! This year (well, 2010) I wanted to make this colorwork neck warmer thingy (it’s hard to call it a cowl as it’s rather skinny) for them. I started it at Madrona (it was a steeks class!) in February, 2010, and put it aside in March because I had loads of time to finish, right? Around November I realized that I was not, in fact, done with one, much less two, and also did *not* have loads of time left until Christmas! So the original was finished. The yarn for the second one is still waiting to be cast on. Whoops. Luckily my other aunt is very generous and probably expects me of this by now. These pictures are pre-blocking. It was extremely narrow before blocking and bloomed in a most lovely way upon washing. It loosened up considerably although if I made one for me I would add one if not two more repeats of the flower pattern. I also think it’s rather tall so I would probably cut out maybe the yellow bits and one section of leaves where it’s doubled up at the top. I think the flowers are genius though! New techniques: Steeking!! I loved working in the round then cutting. Woo! My friend Will asked if I could make some crocheted ewoks. Sure, I thought, why not? I can crochet. Well. I *thought* I could crochet. Turned out I had a lot to learn! Not only about crochet in general but amigurumi in particular. But I persevered because a) I said I would and b) how stinkin’ cute are crocheted ewoks? Very cute. I like cute. So I persevered. I’m so glad I didn’t give up. Aren’t these little guys cute? The boys, of course, were totally enamoured and wanted their own. Turns out they were enamoured with their own for about 2 seconds. Oh well. *I* like them. In fact I’m seriously considering building a treehouse for the ewoks. Because really, why not? How cute would that be? Very cute. You see the theme here. The funny thing is that the boys were totally fascinated with them before they even looked like ewoks. In fact they looked positively alien for a while. I imagine if you did these in grey and stopped at this point you’d have that alien guy from American Dad. Yarn: Cascade 220 superwash (slightly thinner than regular as this called for dk) plus random scraps for the hoods, hands and feet. Once upon a time there was a child who needed a Christmas stocking. Mama had knitted a stocking for Big Brother when Big Brother was just a baby, and now it was little one’s turn. Unfortunately for Mama, she did not do a gauge swatch on the first knitted stocking and it turned out HUGE. The baby could fit in it huge. Ginormous stocking. So, there was much to live up to because you can’t exactly have one child with a gigantic stocking and one with a regular size stocking. Therefore littlest’s stocking was clearly going to gargantuan as well. Now Mama was in a bit of a felting phase at the time and thought, “I know, I’ll hand felt a huge stocking! That sounds like a brilliant idea!” So she did the test swatch (having learned THAT lesson before) and did the math to see how big the stocking would have to start out in order to end up the proper (ginormous) size. It took up an entire half of the cutting table! There wasn’t a piece of plastic large enough in the house to make the resist, so a garbage bag was used. Hey, whatever works! Laying out the second layer of batting -- sparkly! That sucker took DAYS to felt. Starting the felting process with tulle on top and lots of towels underneath! Mama had to roll for what seemed like hours, then work in sections on the washing board, and generally pound the thing to death. Somewhere in there either the felting was different from the test swatch (entirely likely has the vertical felting was limited) or the math was just plain wrong (also entirely likely) and the stocking ended up too tall. The right boot size but too tall! Of course that wasn’t the end of the story. No, it can never be THAT simple. For Mama had a Plan and the Plan included Polar Bears. Mama had seen an utterly adorable stocking in some catalog or another that had a Mama Polar Bear and a Baby Polar Bear and the image got stuck in her head. But Mama knew she could improve upon the idea and so was determined to make her own version. Therefore in order to complete the Plan, Mama needed to make some white felt, obviously, for the Polar Bears. By Christmas, the blue stocking was in existence and the white felt was in existence, but neither knew of the other. “Oh well. It can wait until next year,” Mama said. However Christmas did eventually roll around again and Mama remembered, “Huh, I think I have a stocking to finish!” So several evenings were spent designing the bears.. cutting them out..
figuring out how to finish the top..
and YET still the stocking was not done by Christmas. All that was left was the child’s name, though, and yes, that too can wait yet one more year. Finished! Without the name though. In any case, littlest seemed to love his stocking, which is good since it took so damn long and took so much effort to make! Next time, Mama said, I’ll just buy the felt and sew the darned thing. Sometimes retail is just so much easier.